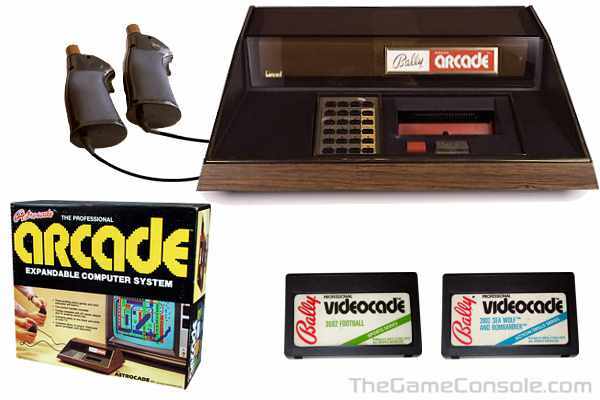 Released in 1978, the Bally Professional Arcade was video game maker Bally's only entry in to the home console market, complete with typical late 1970's wood grain. The little console from the 70's that just wouldn't die, it enjoyed several rebirths similar to the Fairchild VES Channel F and significant home brew/user following. In 1972, Bally missed an early entry in to video games, by telling one Mr. Nolan Bushnell they were not interested in his Pong video game. With Pong starting the video game arcade revolution, by 1975 Bally decided to create a video game division called Midway (referred to as Bally/Midway) for the purpose of entering this market. It was decided to base the new console around the Zilog Z-80 microprocessor. A processor making it's way in to arcade games and fast becoming the processor of choice in the still developing microcomputer movement. The graphics system was to have an advanced display system known as bit mapped graphics. In bit mapped graphics, each pixel of the screen is mapped to a corresponding memory location.